One of the things I’m most keen to do as a Councillor is encourage and support walking in Winchester. I’ve been a campaigner for 20 mph zones for years. Since election to the County Council, I’ve successfully pushed to get pro-walking schemes on the development programme for Romsey Road and Stockbridge Road (and, yes, I’ve asked that these should include improved crossings at Boscobel Road and Clifton Terrace/St James’ Terrace). And my work with the Men’s Health Forum has made me only too well aware of the health benefits of walking. Read the excellent Walking Works report by Public Health England, the Ramblers and Macmillan Cancer Support if you want to know more about walking and health. One of the other initiatives that I’m involved with is the Winchester Walking Strategy Group – chaired by my council colleague Robert Hutchison – and with the expert input and advice of Liz Kessler. And it was during one of these meetings that I thought I’d tweet and Facebook a question to see what local social media users might have to say about walking in Winchester. At a meeting to discuss a walking strategy for Winchester. What do _you_ think we should do to help get more journeys made on foot? First out of the blocks was Chris Walker, an IBM-er in North Carolina, who referred to some rather interesting work being done by walkyourcity.org in the US, where they allow people to generate their own walking street signs! @mpntod You should look at @WalkYourCity has been doing here in Raleigh and elsewhere. We’ve got something similar, although less bottom-up, coming with new wayfinding signage for Winchester (details here), coming in the next 12 months – although it does make me wonder whether we should have some ’20 minutes to the centre’ and other similar signs a bit further out. 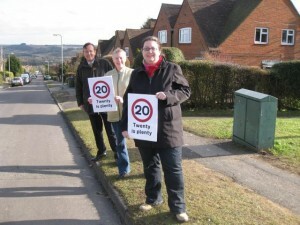 WinchesterLady1 then highlighted the need to make the pavements we have safer. @mpntod ..Make the pavements safe to walk upon! @mpntod ..Staple Gardens and Cross Street are horrendous…. @mpntod Priority to foot over cars at traffic lights: no long delays before crossing light. No clutter on pavements. Less air pollution. @mpntod I love the "stop all traffic" red lights at City Rd/Train stn. Just need a few more seconds to get across diagonally. and Andrew Wilcox on Facebook. Julian also pointed out the problems with pavement parking. @mpntod Stop cars/vans etc from parking on pavement (against law if driven on to p/mt, anyway). @mpntod Liz notes that a bad example is in High St – parking meter and scaffolding blocking pavement. @mpntod Hedges etc halving path width. Home owners plant right on border so half of hedge covers public path.Dull point, real problem. I’m not entirely sure what can be done about this – Andrew Wilcox suggested a solution on Facebook! @mpntod Stop trying to build on much loved and well used green spaces? Close the City centre to through traffic save buses, taxis, bona fide delivery lorries and cycles during the working day. Cars can only enter the central zone with a token. They can only purchase a token from a passing pedestrian or cyclist. Every car must be partnered with a cyclist capable of doing 20mph flying a red flag. Car drivers could be rewarded with privilege car parking points for driving at 20mph or less in the city centre. Detectors would be covert and not coated in yellow paint. Install Formula 1 fuel meters on all internal combustion engines. Prizes for best mpg. @mpntod it's already been done for me. No one will give me a parking permit! I was watching a very interesting ted talk a while ago about how replacing a few city centre roads (or bits of roads) with inviting chill out type space had a massive impact on visitors and local spending. Even loosing tiny bits of road space to create these pedestrian zones had a great affect. I’m wondering if this would also encourage more walking. Looking at a map of Winchester to see if this could work. It already did work with the High Street but I’m sure the pedestrianised area could be expanded. Need to rethink the parking conditions imposed by planners on new developments. They are already concern to us in Olivers Battery in relation to re-building St Mark’s hall – there is no space for additional parking. @mpntod Developers forced to connect devs up. eg. Marston Gate/Hyde Abbey Rd pedestrian connection cynical ploy to deter walking. Think New Urbanism, @mpntod. Stop prioritising cars! Walking down North Walls w/ small children is terrifying. Station junction is hostile. Walking can feel very unpleasant in places especially Chesil Street and the bridge by the Mill. Make sure the 20 mph is city wide especially North Walls. Finally, after I posted a link to beat the street on Facebook, there was a lot of interest in ways of promoting walking – particularly in schools. 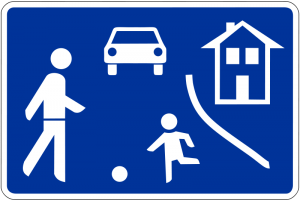 School projects to promote commitment from kids and parents to walk to school. 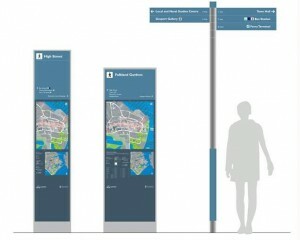 Provide rewards for walking to shops, schools, pubs etc. Wow, yes, exactly like that! Can we, can we, please Martin , make it happen!!! I’ll make sure the rest of the team knows about these ideas and double-check that they are properly reflected in the plan! PS: If you want to see the response on Facebook (or join the conversation), the full Facebook discussion about walking in Winchester is here – and the full discussion on Twitter is here. This entry was posted in 20s plenty, Walking, Winchester. Bookmark the permalink.